The Praia do Barril is one of the finest beaches of the eastern Algarve, and makes for a fascinating excursion from Tavira. 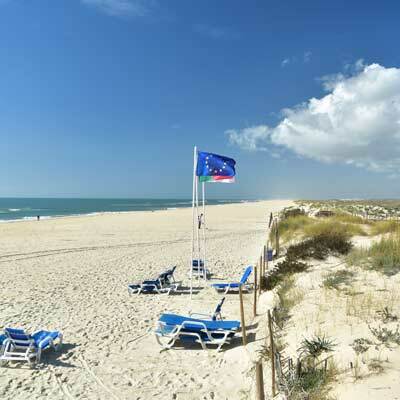 Barril beach not only provides the pristine white sands and crystal-clear sea waters that is characterised by the eastern Algarve, but it also provides an insight into the historic fishing heritage of the region. The beach was once the location of a small tuna fishing community, and remnants of this bygone industry have been respectfully transformed into the tourist facilities of the beach. 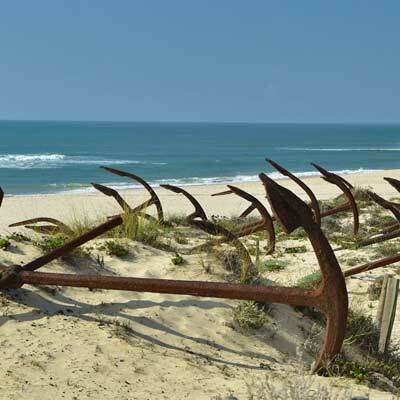 The most notable feature of the Praia do Barril is the Cemitério das Âncoras (the Anchor Graveyard), a rusting memorial to this former tuna fishing fleet, which comprises of the anchors used for the fishing embedded into the sand dunes close to the beach. 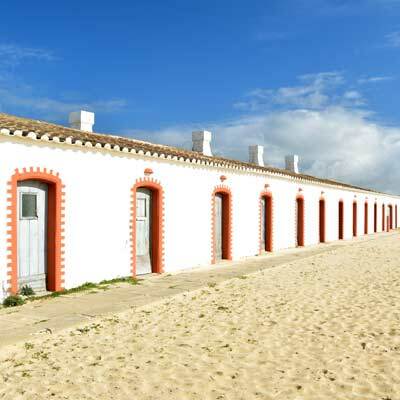 The Praia do Barril is great location for a day on the beach, but it is also a fascinating place to visit. 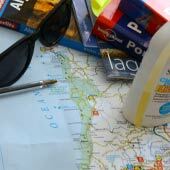 This article will provide a tourist guide to the beach. 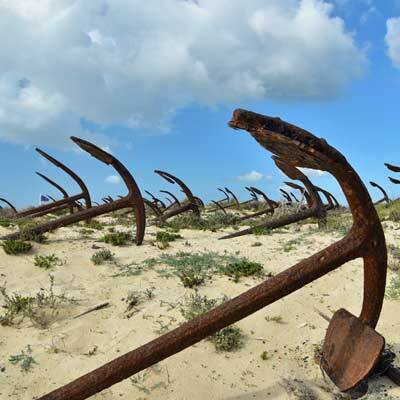 The Cemitério das Âncoras (Cemetery of Anchors/Anchor Graveyard) – the permanent memorial to a dangerous and difficult profession that no longer exists within the Algarve. The former fishermen huts, which have been converted into cafes, restaurants and shops, ideal for a leisurely day on the beach. 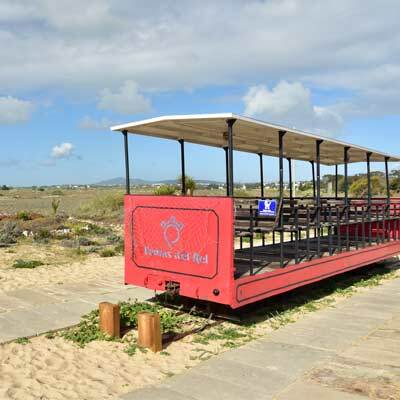 The mini-train that transports visitors the 1.5km from the mainland to the beach, which children will adore. Barril Beach is a sandy beach and is a section of the Ilha de Tavira southern shoreline. The beach is safe for children, with calm and clean waters, and is supervised during the summer season. 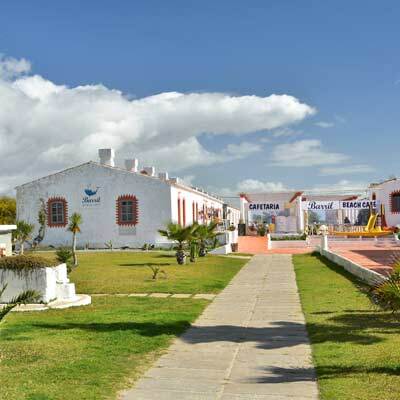 There are good facilities at Praia do Barril including three beach restaurants (Snack Bar Ancoras, Blue Beach Bar and Barril Beach Café), beach stalls and clean public toilets. Sunshades and parasols can be hired for €12 per day, but during the peak months they are pre-booked and do sell out (if visiting in the summer its worth bring your own). The beach is 1.23km from the mainland and is served by the mini train or footpath. There is a large car park at the beach (€7 full day parking) but the free parking along the road quickly goes in the summer. 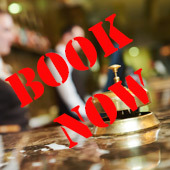 There is a limited bus service from Tavira (Monday to Friday only), and details are at the end of the article. Traditional tuna fishing methods used to create a maze of nets, which would ensnare the large and powerful Bluefin Tuna. These complex structures required hundreds of anchors to secure the nets against the ferocity of the Atlantic Ocean and the strength of the tuna. 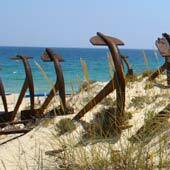 These fishing anchors are what line the sand dunes of the Praia do Barril and are a symbolic memorial to the decline of the tuna and the abandonment of this way of life. 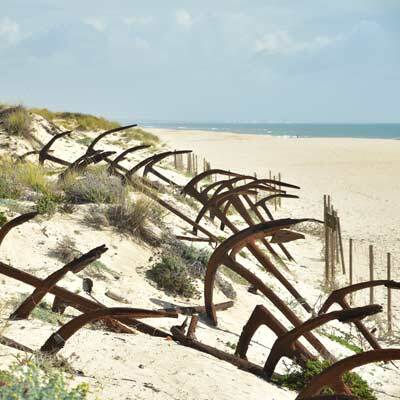 The rusting anchors of the Cemitério das Àncoras were placed in the sands during the 1960s when the livelihood became unsustainable and today there are no Bluefin Tuna in the seas of the Algarve. 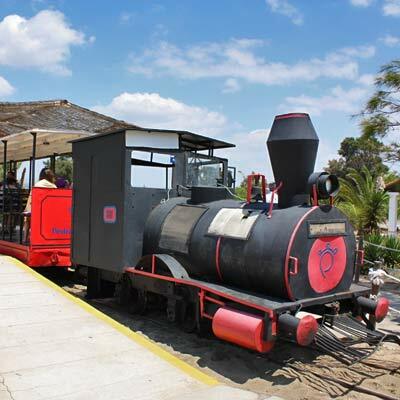 Barril beach is connected to the mainland by a miniature railway, which costs €1.50 for a single ticket. 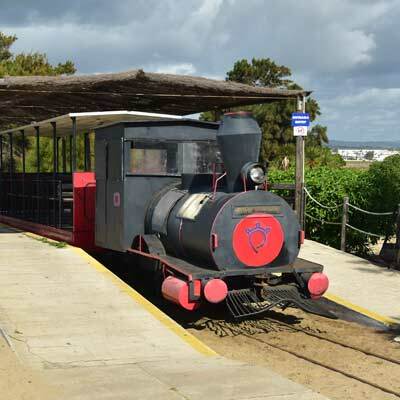 The 1km railway was originally used for hauling goods and freshly caught fish between the fishing community and the village of Pedras D’el Rei but today transports overly excited children and tired parents! 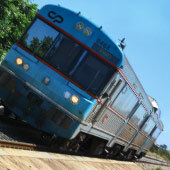 Children will love the mini train, and it saves a long walk! The small fishing community on Barril Beach was home to around 80 families during the tuna fishing season, from April through to September. The village was abandoned in the 1960s, with the depletion of tuna stocks, but today the small, whitewashed dwellings have been restored and converted into cafes shops and classic beach huts. 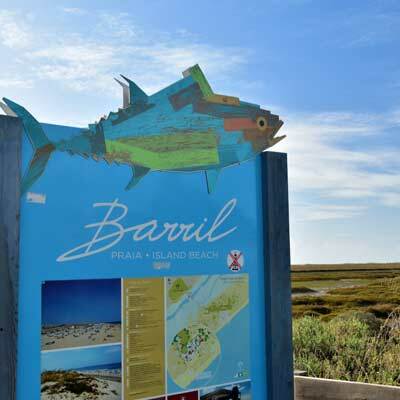 How to travel to Barril Beach? (the timetable states 2012 but was correct March 2019). A taxi from Tavira to the entrance of the beach would cost €7.00-9.00, but few taxis pass the beach for the return journey. Uber is always an option instead of a taxi. One of the best ways to reach Barril Beach is to hire a bike and cycle there as the route follows part of the Ecovia do Litoral cycle path, a purpose built cycling route that one day will stretch the length of the Algarve. 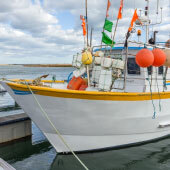 The route follows the M515 south west out of Tavira and passes through the pretty fishing village Santa Luzia. 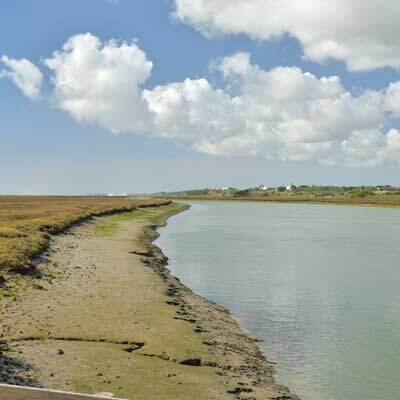 To walk to Barril beach from Tavira takes 1.5 hours and a pleasant extended hike is to return along the beach and catch the ferry into Tavira. Barril Beach is part of the much larger Ilha de Tavira island which extends for 10 km from Tavira down to the town of Fuseta. 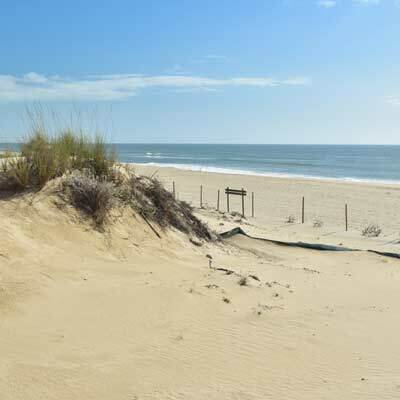 The entire southeastern facing coast of the island is a glorious sandy shoreline and the region is protected by the Ria Formosa nature park, a haven for small saltwater aquatic life and migratory birds. 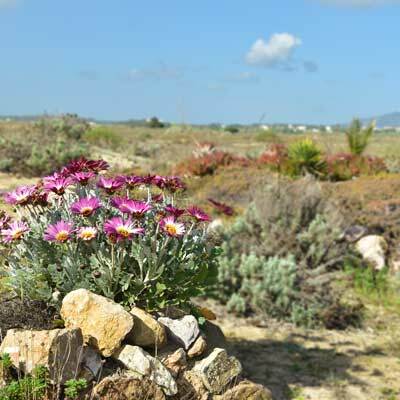 This Nature Park designation has limited tourist development, which blights the central Algarve, and has ensured that the coastline has a pristine and unspoilt appearance. 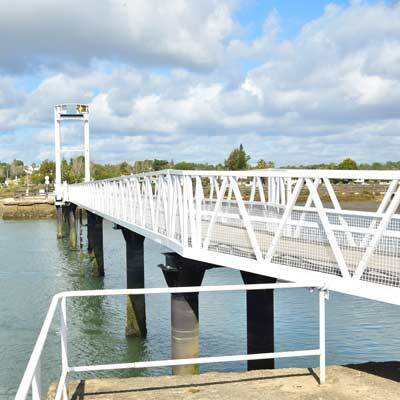 There are no roads to the Ilha de Tavira and the Praia Do Barril is the most accessible section of the island as there is a footbridge to the mainland. All of the other beaches on the Ilha de Tavira, including the beaches close to Tavira, require a ferry ride as there are no bridges. As the Ilha de Tavira has a shoreline of 10km it is very easy to lose the summer time crowds with a short walk along the golden sands. The next beach along from the Praia Do Barril is the Praia de Terra Estreita which tends to be even quieter than Barril and has a regular ferry to the fishing village of Santa Luzia. The Praia do Barril has calm and clear sea waters that are safe for children and families. The sea temperature of the eastern Algarve tends to be slightly warmer than the western Algarve but is surprisingly cold when compared to the Mediterranean. On the beach a parasol and two sun beds can be rented for €16 for the whole day. 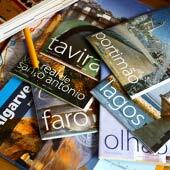 Home page and why visit Tavira for a holiday? 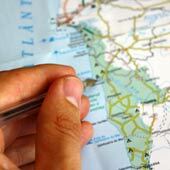 What are the major sights and activities in Tavira? 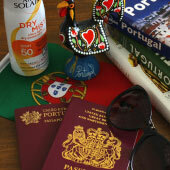 a 5 day holiday to Tavira?